A market at Dzaleka Refugee Camp in Dowa district, Malawi. The United Nations refugee agency today welcomed a decision by the Malawian Government to reopen a former refugee camp to help cope with the rising numbers of people fleeing internal fighting in Mozambique. The decision was announced on Friday and involves reopening the Luwani camp, which previously hosted Mozambican refugees during the 1977-1992 civil war and was finally closed in 2007. The Office of UN High Commissioner for Refugees (UNHCR) said preparations are under way for the move. Located some 65 kilometres inside Malawi, Luwani has more than 160 hectares of space, including forest. “Refugees will have better facilities and services there, including health, education, water and protection, and, importantly, it will be safer,” UNHCR spokesperson Leo Dobbs told reporters in Geneva, noting that the existing Kapise camp, just five kilometres from the border, will be used mainly as a transit facility. Most new arrivals are in Kapise, and to date, 9,600 people have been registered by UNHCR staff and Government workers, he said. Including those waiting to be registered, the total is almost 11,500. Daily arrival rates have risen from around 130 people a day before late February to around 250 people every day now. Several partners, including the UN Children’s Fund (UNICEF), World Food Programme (WFP) and Médecins Sans Frontières (MSF), are providing essential services in Kapise, including water boreholes, food and health care, but conditions generally remain tough. Mozambicans who arrived earlier in the year spoke of having fled deadly attacks on their villages. More recent arrivals have said they were fleeing out of fear of clashes this month between Government forces and RENAMO, the main opposition group, which wants to take control of six northern provinces, namely Manica, Sofala, Tete, Zambezia, Nampula and Niassa. Lack of funding for UNHCR and others is a problem. About $1.8 million is required to meet immediate needs, but more will be needed to cope with the growing number of arrivals. Malawi also hosts some 25,000 refugees, mostly from the Great Lakes region and the Horn of Africa, in the Dzaleka camp, about 50 kilometres from the capital city of Lilongwe. The site is full to capacity, and food rations have been cut to 50 per cent since October and resources to assist refugees are limited. 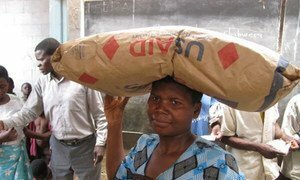 Over the coming year, humanitarian partners should prepare for food insecurity levels and food insecure population numbers in southern Africa to be at their highest levels since the 2002-2003 food crisis, the United Nations agriculture agency warned today, citing an 'intense' drought as the main cause.